In her freelance artistic work, the photographer Laura Fiorio (*1985, Verona, Italy) focuses on inhabited landscape and its transformation, with a particular interest in the topic of housing, human geography and personal archives, where private space becomes a mirror for the wider public environment. © Maria Vittoria Trovato Her approach through photography is an interest in public art and the role of photography as a vehicle for change. Her projects address transition, gentrification, displacement of people and spaces – both of local and of global importance while focusing on everyday life, developing collective and participatory projects in which observation escalates into interactive performances. With confidence in the power of photography, in its ability to communicate and as a tool for connection, discovery and reflection, her work is often concerned with social and educational matters. 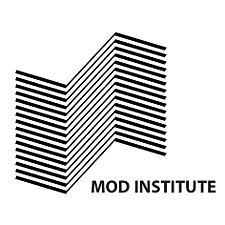 After studying Performing Arts, Visual Communication and New Media Arts at the IUAV and the Academy of Fine Arts in Venice 2010 and Film and Interactive Media at Middlesex University in London 2009, Fiorio started her professional career in the film and photography production between Berlin and Venice where she lives and works today. 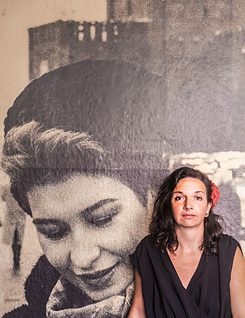 As freelance documentary photographer, Fiorio worked for museums and cultural institutions like Haus der Kulturen der Welt, ZKU, Venice Biennale, as well as a production assistant for well-known artists and researchers like Francesco Jodice, Armin Linke, Elmgreen & Dragset. In 2015 she received a Masters in Art and Social Work at Alice Salomon Hochschule in Berlin, through which she started working in educational multimedia projects in prison, refugee camps and homeless shelters. One of her long term research projects «La border curios» which is about postcolonial cities was realised in Tijuana in 2017 thanks to a residency supported by the Goethe-Institut and Relaciones Inesperadas. The project focuses particularly on the topic of border and migration, working together with students and deported people. «La border curios» states that borders are fictional geographical divisions between lands and nations are just human creations that aim for division rather than inclusion. The project underlined this mutability along with the absurdity of the notion, which was explored by vacillating between the line of what is documentary and what fictional. 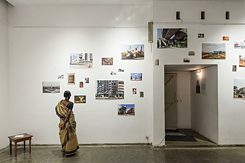 In Bangalore, she will work with the MOD Institute on local strategies of living and conceiving the urban and common space in a postcolonial city which is expanding and developing fast, researching and collecting images from private archives and working with locals and passers-by to create a common archive of everyday life in a specific neigbourhood. 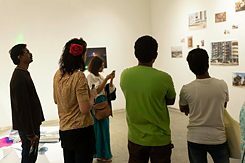 The bangaloREsidency was a great experience which enriched me with a lot of new inputs from the places and the people I was lucky to meet on the way. It was an exchange of knowledge and culture which happens naturally when you visit a new country but the way the team and the network of people involved in the project welcomed the group of residents in the lively cultural life of Bangalore helped us to get a deeper contact with the city. Being in a group of people coming from Germany was also really nice as new collaborations and friendships raised not only with local people but also between residents, building a transversal, international and transmedial network between artists coming from different disciplines and different countries. In the first days we were taken around by our hosts and introduced to many persons working in association, institutions, schools, galleries and theatres in town. So we were collectively immersed in the local scene and connected with many possible collaborators. For me it was also really important to create my own individual experience, and creating a local network outside of the art scene, as my research mainly starts from the streets, so the rest of the time I was just wondering and walking around looking for inspiration to focus on a project during my residency. Working on gentrification and urban development took me to the outskirts of the city, seeing areas of town and places which most locals wouldn’t recommend visiting at all, and to meet communities being menaced by eviction or living in informal architectures, with all the problems linked to the topic. What struck me was the generosity and curiosity of the people I met: Everyone welcomed me into their homes even seeing me for the first time, and everyone was observing me attentively, probably finding me even funny and strange, so to say, exotic, asking questions about me and the faraway place I am from.